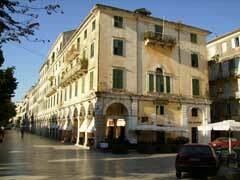 The superb architecture of the old Kerkyra town with the Venetian influence. The green landscape and the traditional little villages that remain umspoiled by tourism. The beautiful sandy and pebble beaches with clear water, many of those been blue-flag awarded. And of course, the friendly and hospitable Corfiots all over the island, kind and helpful to everyone in need. All the above, have given Corfu its reputation, making it one of the most favorite places to visit. Sights like the Achilleion, the Old and the New fortresses, Espianada square and the Liston are recognizable all over Europe. As a result, thousands of tourists visit the island of Kerkira every year and return home with the best of memories. But Corfu is not only about monuments and sights. There is a wonderful landscape, with so much variety, ready to be explored. Dirt roads and narrow paths with the olive groves as a background, are ideal places for walkers and mountain bikers. For the flying enthusiast and the acro pilot, Corfu is a "must visit" island as it combines holidays and sport activities, It offers all the standards and comforts someone would ask for, with hotels of all categories and appartments in reasonable prices. 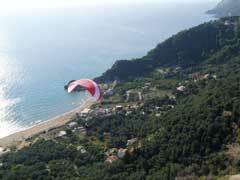 But most of all, it provides the ability to enjoy the wonderful sport of paragliding - parapente. Korfu is an island and as such it doesn't have any high mountains like in the mainland. The highest is Pantokrator at 980m from sea level. However, there are several sites where someone can take-off and enjoy flying. The atmospheric instability along with the sea breezes guarantee strong thermal flights. Transportation around the island is easy so is up to anyone to choose where to stay. In the next page there is information of the most commonly flown sites of Corfu.